t all started with a quadraphonic sound, at least that's how I remember it. 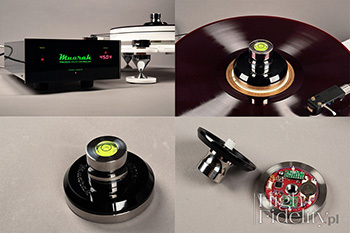 In 2015, MUARAH debuted during the Audio Video Show in Warsaw and presented a complete system for playing a quadraphonic signal from a vinyl record. The set included the MT-1 turntable (or: Mr. Black and Mr. White - the same design, different colors), combined with the Jelco SA-750D tonearm, the SQ quadraphonic signal decoder which was an extension of the MU-2 model and tube amplifiers MU-4. All of these components were designed and manufactured by Muarah. It was a true rarity on the Polish market, because it is rare for a company to start with such a complete lineup, so well-designed, and in addition with such a clear business idea. The components in question were not cheap. The quadraphonic technique is very specific and it has little to do with a realistic presentation of a musical event. It is rather about so called "effects", which is why the number of its fans was always small and it remained so. Much more interesting, from my point of view, and offering more possibilities, is treating this company's turntables like classic stereo devices. The MT-1, also called by the company Mr. Black or Mr. White, depending on the color of acrylic they used, remains the top product of Muarah. 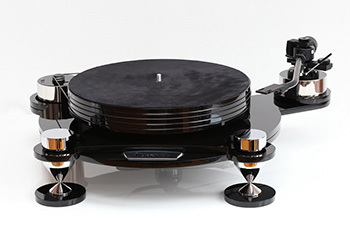 It is a decoupled design with springs used for isolation from vibrations, which is a solution taken straight from the 1970s, known from turntables such as Arista, Linn or SOTA, supported with oil damping. It is not without significance that these designs come from the same time a the quadraphonic technique. 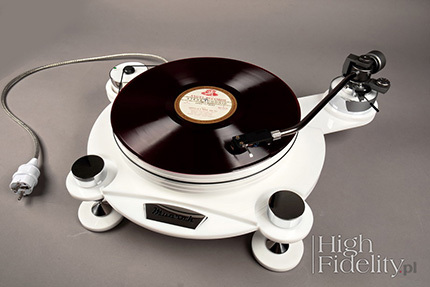 Although successful, enjoying some support, it has one serious limitation: such turntables can not be fitted with a tonearm longer than 9", because then the spring suspension would be unevenly loaded. The answer to this problem is the cheaper than MT-1 - although not cheap - MT-2 model with a non-decoupled design. But this is not a forced answer, because it offers more than just compatibility with arms up to 12" long. The idea was to prepare a solid turntable, using solutions from the more expensive design, one that could additionally make use of some external peripheries, but which would cost, along with the Jelco SA-750L arm, around 10,000 zlotys. About us | We founded Muarah Audio in 2015. As engineers, graduates of the Warsaw University of Technology, specializing in electronic circuits and electro-acoustics, we had a good basis to design electromechanical devices ourselves - and we decided to make use of it. However, we have gained practical experience already before, realizing our hobby. Wiesław Zawada is passionate about mechanical devices, a lover of classic motorization and general automotive technologies. He loves designing and creating new products, he is unbearably meticulous - he takes care about every detail. I, in turn, (Jacek Siwiński - editor's note) from when I was a kid, I dealt with electronics, mainly sound processing devices: amplifiers, guitar effects, radio sets. My great passion are quadraphonic vinyl records, and I have quite a collection of those. Music is our common passion (we've created our own rock band at university). We also have a constant need to invent something new. Thanks to this, the Muarah product portfolio is constantly expanding and we have many ideas for the future. timeless values - this is why we focus on analogue technology, and the sound source we promote is a vinyl record. Our business philosophy is based on, among others, promoted by prof. Jerzy Hausner, Open Eye Economy, which assumes that the customer is most important for the entrepreneur and the quality of services and products delivered to him. The adequate profit is to be only a consequence and not a goal in itself. That is why we manufacture our devices in Poland and we are not looking for savings at the expense of compromises or resignation from our main postulates. Lineup | Our lineup initially included three devices, elements of a system for a demanding audiophile, a vinyl lover: the MT-1 turntable, the MU-4 integrated tube amplifier and the MU-2 tube phonostage. Their reception by clients and industry journalists was very positive. We were very happy because of the recognition of the fact, that our devices were refined from the very beginning, even though we were just starting our business. 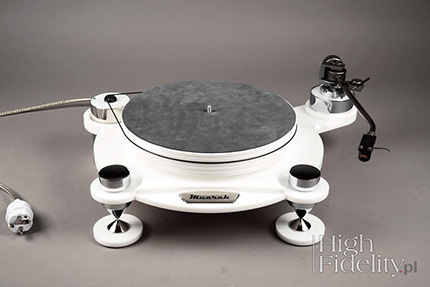 So following our initial success we designed the MT-2 turntable - lighter, simpler and much cheaper, but adapted to work with 9" to 12" arms. 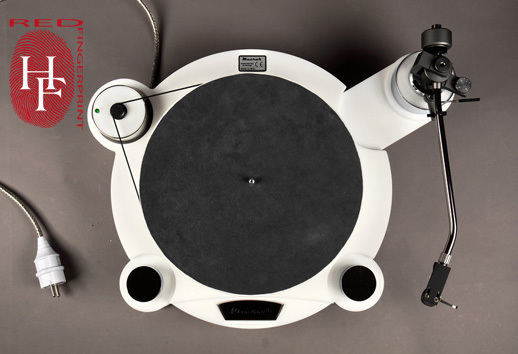 At the same time, we developed Precision Speed Controller, a unique in global scale controller of the rotation speed of the turntables platter. The PSC uses a feedback signal, transmitted wirelessly from the smart record clamp – the InteliClamp. The whole solution was submitted to the Patent Office. a power loss detection system and immediate disconnection of the output signal used in all our electronic devices. Let me also mention that we have developed a prototype of a modern decoder for playing quadraphonic vinyl records in SQ format. We organized several presentations of this technique, including one during the Audio Show 2015, in the SoundClub headquarters in Warsaw and in the City of Lodz Museum. These were unusual events which – in our opinion - besides promoting our own brand, propagated the vinyl technique itself. We plan to produce a multi-channel preamplifier, which will feature a SQ / QS decoder, which will also enable playback of multi-channel SACDs or DVDs. We know that there are some customers interested in such product. The MT-2 looks fantastic. Its design is modest, but also interesting, and a fit&finish equal to that offered by well-known companies from Europe. Its base is made of two acrylic boards, same as the 3.5 kg platter. There are two colors to choose from - white or black. The tonearm base, the cylinder which houses the external motor, and three large feet are in turn chromium-plated brass. The feet are the company's own solution and they constitute the main decoupling element. These are high cones of large diameter, with their sharp points hiding in the openings of the second set of cones, that are turned upside down. The lower cone is permanently joined with small acrylic pads. Underneath they feature small rubber pads. From the top, the feet can be screwed in or out using large caps – that allows user to level the deck. The main bearing is Muarah's own design, same as the base block for the tonearm, which extends from the base, allowing the use of different tonearm lengths. The synchronous motor (AC) is placed next to the deck in a cutout. It is closed in a heavy cylinder made of chromium steel. At the top there is a switch with green backlight. The basic version, that is without an external controller, the speed change is performed manually - you have to move the belt from one pulley on the motor axis to another. There is also a leather mat that should be placed on the platter. And that's it. It's a relatively simple but well made device. Manufacturer recommends pairing it with the 12" Jelco SA-750L arm. But one can also consider the latest and at the same time the most expensive arm from this manufacturer, the TK-950L (6650 PLN). This test was performed use both arms in turns. 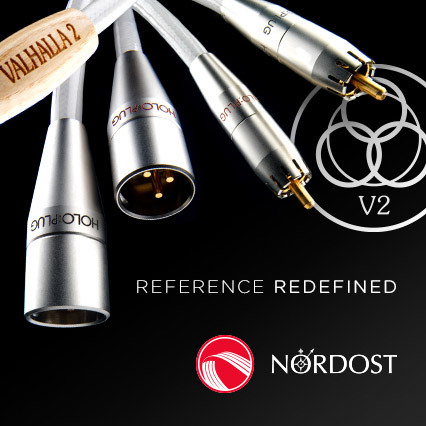 Replacing the tonearm is not the only upgrade one can use. The external motor controller called PSC (Precision Speed Controller) is even more important one. The synchronous motors are excellent due to their unchanged operation over time, even when they start to wear off they spin just the same. They are called "synchronous" because they synchronize with the frequency of the power supply - in Poland it is 50 Hz. Obvious problem is the fluctuation of this frequency, which in the last year have been really significant. Just remember how late the clock in the oven was, synchronized also to 50 Hz, to realize the scale of the problem.